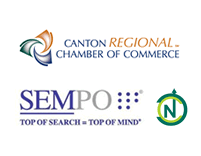 I was in Akron Ohio the other day talking to a client about online marketing, SEO, the current economic situation, the bailout bill and business in general and I realized that we’re pretty much in this alone as small business owners. It’s a scary thought to think that as small business owners it’s really up to us. We’re not going to get any bailout money or support from the government if we go into debt or have troubles. Nobody will hold our hands – they won’t even look back when we hit the ground. We simply have to make good decisions or die. 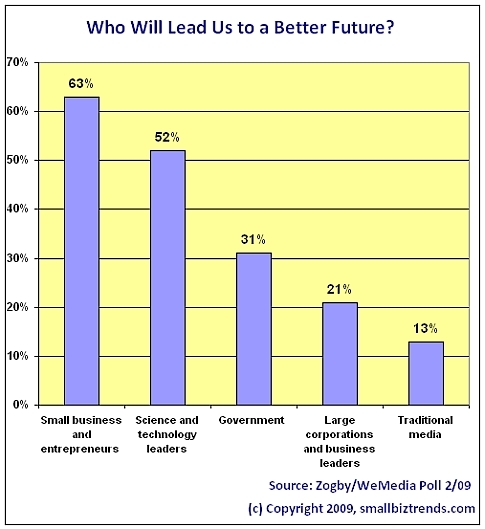 I saw an interesting report today via the small biz trends site that was conducted by Zogby and the results showed that most Americans believe small business will lead the U.S. to a better future (see chart below), not the news media, government or large corporations. I whole heatedly believe that this is true since 90 percent of all firms in the U.S. have less than 20 employees and those firms are responsible for over 97 percent of all new jobs in America (source). Small business also generates the majority of the innovations. What I’m looking to do with this post is simple. I want to remind you that now is our time to sink or swim because we are the leaders and the backbone of this country. It’s imperative that we all become leaders in our organizations and communities, think outside of the box, focus on creative ways to keep going strong, try new things and serve our clients better, and, return HUGE value because it’s very clear that government is not going to be anyone’s solution – it never has been. I do believe government has it’s place and can do great things for the common good, but overall we need to do our job as small business owners and that starts with leadership. Leadership in our company, leadership in our community and leadership in our industries – and of course – being leaders for our clients and customers. It really is up to us to make sure that our boats do not sink and one of the most important lessons that I’ve learned is that you DO NOT scale back marketing during tough times – you expand it. You don’t fall back to old habits, you try new things. You have to continue to spend money AND try new and creative things to survive and it’s as simple as that. I need to make the point too that thinking outside of the box does not always mean going high tech or trying the latest fads. Obviously I’m partial to the internet, but, “thinking outside of the box” might mean stepping back and trying something as simple as getting in touch with your existing clients instead of always trying to find the next sale. (enter shameless self promotion) I do believe though that now is the perfect time to invest some money into marketing online because there is no more effective or affordable way to market your business in my opinion. Out of all the small businesses that have websites, half of them spend less than 10% of their advertising budget online. So there is plenty of space to position yourself prominently. Cutting the marketing budget is one of the biggest mistakes that any business owner can make. Do not clam up and cut your budgets and revert back to the old way of doing things unless they’ve worked especially well for you. I’d like to help as many businesses as possible fully grasp the power of the internet. We can help you take that step forward if you have not done so already. We can help you to use the internet to grow your business in tough times like these because it’s no longer a fad. It’s an amazing tool in your marketing arsenal – and it’s highly effective. Let our president inspire us to hope for an improved world because I think that’s highly valuable – and he’s good at it. Let us lead ourselves to a better future by being creative, innovative and most importantly continually working toward being a small, but strong part of this country’s backbone. Let us lead our businesses and the country to the highest levels possible in the years to come as the general public has so strongly predicted. Here are a few additional marketing ideas to help you on your way.